On a hot summer day in 1994, Yasser Arafat returned to Gaza after twenty-seven years in exile. 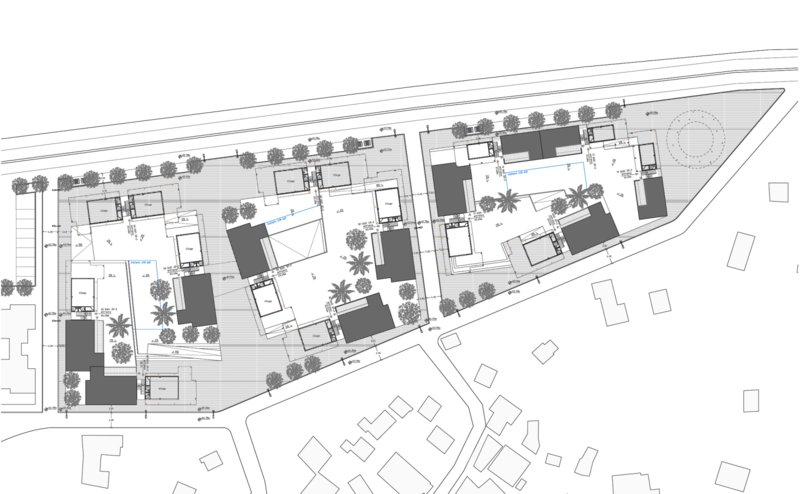 The Al Nada neighborhood, located in the very northern part in Beit Hanoun, was among the few social housing projects built to host Palestinian returnees; material evidence of the attempt to transform refugees into citizens. The politicians of the time wanted the architecture of Al Nada neighborhood to look like the informal architecture of a refugee camp. Instead, an orthodox modernist design was used to contrast with the informality of the Bedouin community that lived in the area. Its location was chosen to counter the expansion of a nearby Israeli settlement, located just a few hundred meters from the Eretz checkpoint. In 2014, half of Al Nada was destroyed by the Israeli army, yet again displacing hundreds of families. The fifty-one days of the Israeli military operation between July and August 2014 caused the destruction of approximately 18,000 housing units throughout Gaza, killing 2,251 Palestinians, the majority of whom were civilians and many of them children. 73 Israelis were killed, most of whom were soldiers (1). In Al Nada and the adjacent informal settlement of Al Izba, the invasion left 192 homes destroyed and 72 families displaced. Reconstruction is often imagined as the counterpoint to destruction. While the two are often seen as opposites, in reality, and particularly that of Gaza, these moments are linked in a cycle. Since 1948, Palestine has been constantly destroyed and reconstructed. In most cases, the effects of reconstruction were more destructive than the destruction itself. Think of the Israeli settlements built on the ruins of depopulated Palestinian villages—the destruction of destruction. At the same time, destruction has the potential to foster new alliances and a different sense of collectivity among people. A project of reconstruction reframes power relations and imposes a different kind of space, social structure, and mentality. What does it mean to reconstruct in a territory that is not only under a blockade, but also faces the imminent threat of yet another war? Architecture cannot prevent a new war; it cannot even pretend to be smart. 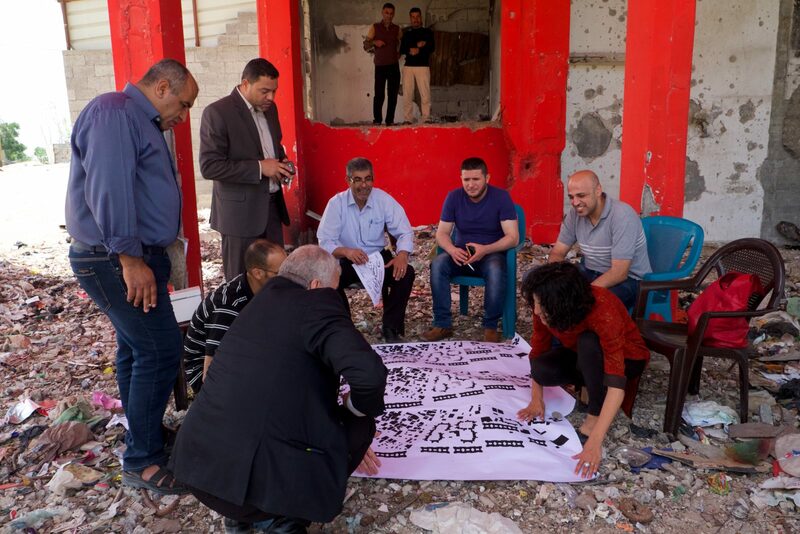 Building concrete-reinforced shelters under- ground in Gaza would expose people to even more danger, since the Israeli army last acted upon the pretext that underground structures are used to hide arms or transport illegal materials, turning them into shelling targets. Architecture is usually called upon to intervene after conflict. But what role can architecture play during conflict? Is it possible to imagine an architecture that preserves a sense of collectivity, in spite of the fragmentation and confines of the Gaza Reconstruction Mechanism (GRM), which only allows for the use of ABC materials (aggregates, bars, and cement)? In which ways can architecture play a central role in the processes of reconstruction, where new relations are established and forms of collectivity are reconstituted? Reconstruction might also force Gaza to be understood beyond a military gaze. Reconstruction forces us to think about life beyond, or in spite of, war. Reconstruction forces us to see things from the ground and from the perspective of the community, rather than from a distance or above. Reconstruction forces us to consider longer temporalities of transformations, rather than short-lived events cultivated by the media. The inhabitants of Beit Hanon became refugees and were forbidden to come back to their original homes. Their territory, once an integral part of Palestine, was turned into a border zone—a no man’s land. The armistice signed between Egypt and Israel separated the village from its agricultural land. The line was not designed as a political or territorial border, and therefore should not have had any effect on rights and claims. However, as in many other territories in Palestine, over time, these “transitory” lines of separation and division have solidified into walls, security zones, borders, and checkpoints. As lawless, no man’s land, Beit Hanoun was a challenge for both Egyptian and Israeli authorities. “Infiltrators” and shootings were threatening its territorial control. For this reason, the dimension of the armistice line was reduced, changing the no-man’s- land status of the place. The redrawing of the line paradoxically allowed for a return to Beit Hanon. “The first returnees” to Beit Hanon were made up of its original inhab- itants, as well as other refugees from villages that had become part of Israel. The Quakers, who were involved in the assistance of the refugees at the time, presented this and the reconstruction of Beit Hanoun as a “model of return” for refugees to their destroyed towns and villages. 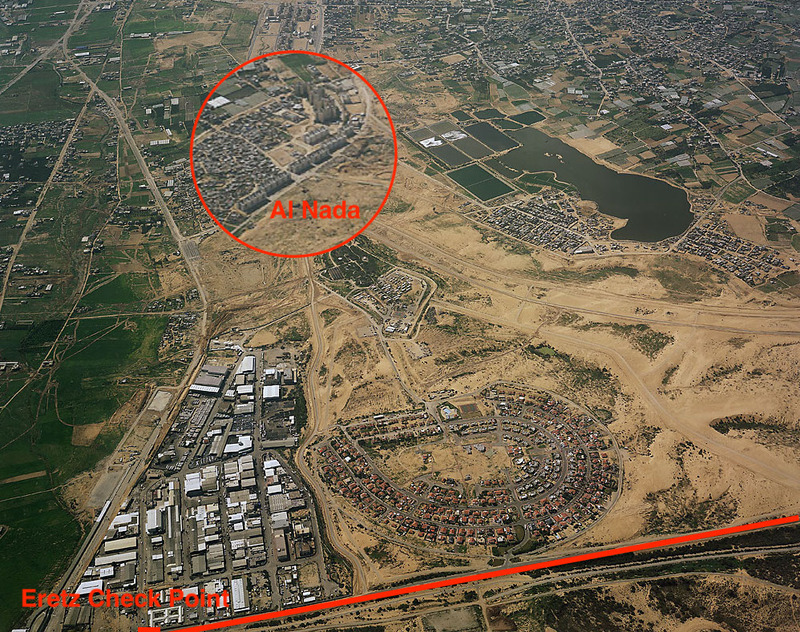 This “first return” formed the first cycle of Beit Hanoun’s destruction, displacement, reconstruction, and return. In the summer of 1994, another incomplete return took place in Beit Hanoun. Surprisingly, or maybe strategically, Israeli authorities allowed for the return of PLO members and affiliates, presumably those who were “the most dangerous” in the eyes of the Israelis, while leaving the vast majority of the Palestinian population in exile, a quarter of which still precariously lived in refugee camps. Was this return another “model” for a larger return that never happened? The naïve modernist blocks still standing in Al Nada today were built to host PLO returnees from Tunis and other locations. 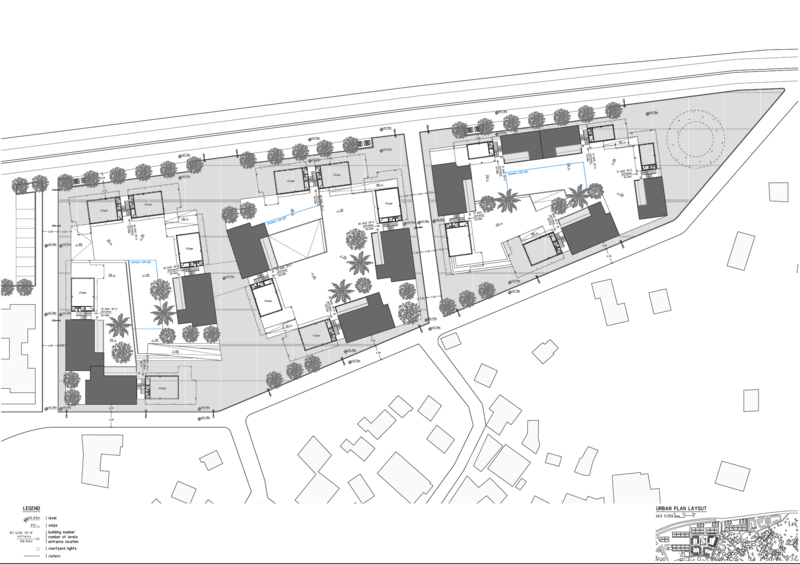 In 1994, the choice of an already obsolete urban model that had failed miserably in so many urban peripheries throughout Europe after the Second World War was likely based on the need both to demonstrate the presence of a working state and to clearly distance oneself from the informal architecture of refugee camps. 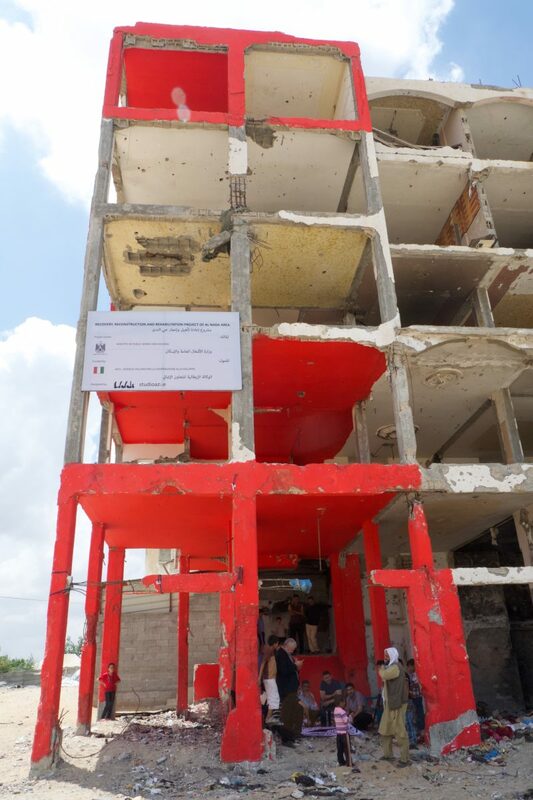 Although the construction of the Al Nada complex was an important step in providing housing to refugees, and was a way to counter the Israeli colonization of Gaza, the state was not strong enough, due to the persistent Israeli occupation, to provide services to residents. Public spaces were never built in between or around the buildings. 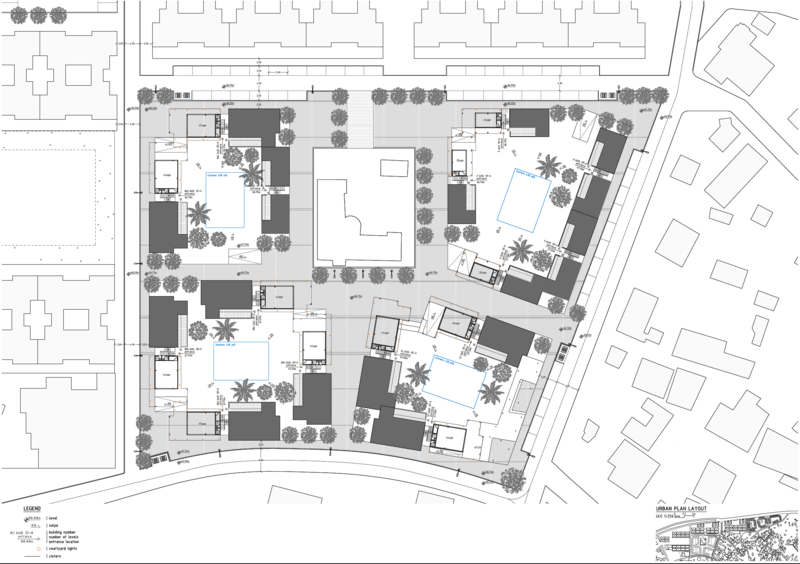 The modernist scheme could not respond to the specific demands of common space existing in Palestinian society, where public and private space is not so sharply defined. It flattened the rich articulation of common spaces into one single category—the public—making it impossible for the emerging state apparatus to ever render them functional. One fundamental principle of our intervention was that reconstruction would not produce any new displacements, nor disruptions of the already fragile social structure. 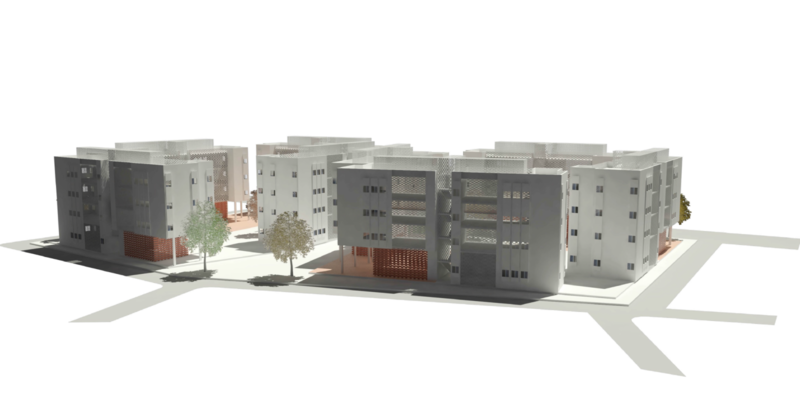 For this reason, the first proposition that we submitted to the Ministry aimed to find a balance between their desire for a rational and well-organized neighborhood and the vital informality of Al Isba. Palestinian returns have not been and never will be about arriving to an ancestral, uncontaminated, idealized pastoral landscape, but rather a return to a complex, dense, and imperfect urban condition. The returnees of 1994 did not return to their original homes in what is today Israel, but to Al Nada in Beit Hanoun—an already inhabited village with its own history of displacement and return. The returnees of 1994 had to find ways of cohabitating with the Bedouin encampment at Al Isba. 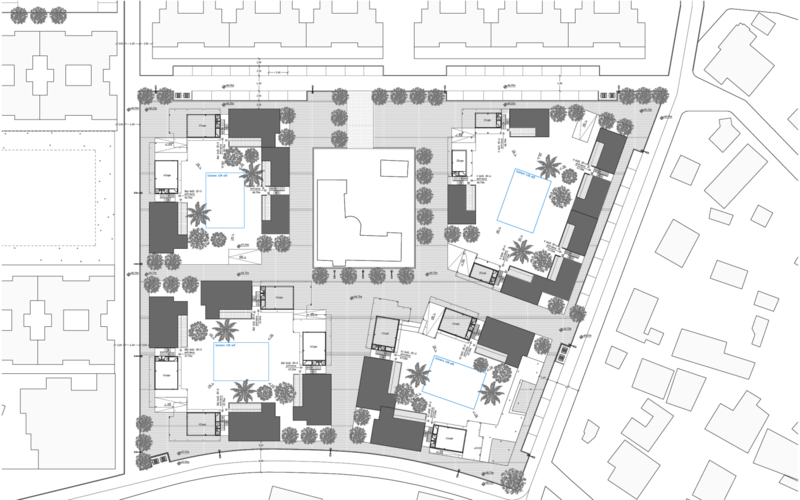 The returnees where originally looked upon as “intruders,” but the Al Nada complex eventually found its place within the sea of Al Isba’s informal architecture. In Palestine, construction happens organically and incrementally, wall by wall, room by room, house by house. It is because of this that, even during a time of destruction, people can already begin to think about reconstruction. 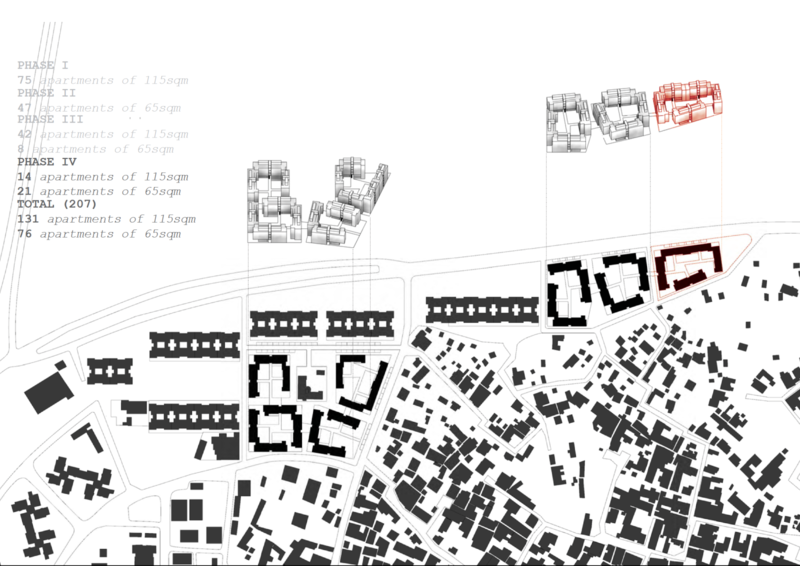 Al Nada, however, is one of the first attempts in Palestine to use a top-down design process to house returnees. In building Al Nada, the PLO wanted to signal its presence in Gaza, which is still perceived as just another big refugee camp. In 1950, Gaza had 80,000 inhabitants and 250,000 refugees. Today, the Gaza Strip is home to a population of more than 1.76 million people, of which 1.26 million are refugees. The 2014 war had the effect of creating solidarity among the inhabitants and a new sense of community. Something we heard a lot in Al Nada was: “We are not the way we were when we arrived here. Now we know each other and we share things differently.” People in the community described what they experienced together, the war, as a journey that made them feel closer and more connected to one another. Our intervention took this new sense of collectivity into account, beyond the impersonal approach of the humanitarian intervention. We recognized the refugees as a community, not just as individuals in need of shelter. During the lengthy participation and design process, we provided material evidence of the immaterial work that was happening between the Ministry, the community, and us. We painted one tower that was still standing, but heavily damaged, in red. Red, a color that was used to mark which parts of buildings to demolish, was here used to bring attention to the hidden relation between destruction and reconstruction. This building was the site of our meetings with the community. It was a gateway to the project in the making. From the outset, the red paint started a process of collective interpretation. 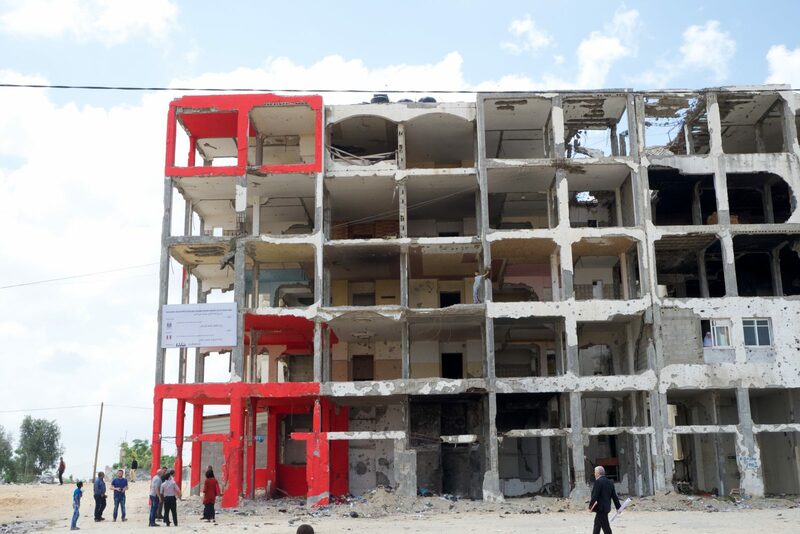 Community members said that the red paint had something to do with signalling something across the border to Israel, or with narrating the destruction and blood- shed caused by the military offensive (as in a music video made by MC Gaza in front of the building). Many people gathered and questioned the structure. Their attention was the beginning of a process of carving out a space for collectivity, and of transforming these interpretations into a sense of belonging and participation in Al Nada’s reconstruction. Collective space is a crucial part of the Palestinian culture of resistance. During the First Intifada, the Israelis closed schools and universities, arguing that any place where more than five people could gather had revolutionary potential. In response, places beyond the eyes of the regime and the occupation, private spaces, became public. These places were where decisions were made and a sense of collectivity was maintained. After all, collectivity is not just about big public spaces. Thus, we proposed a series of collective spaces that did not need to be mediated, or taken care of, by the state. 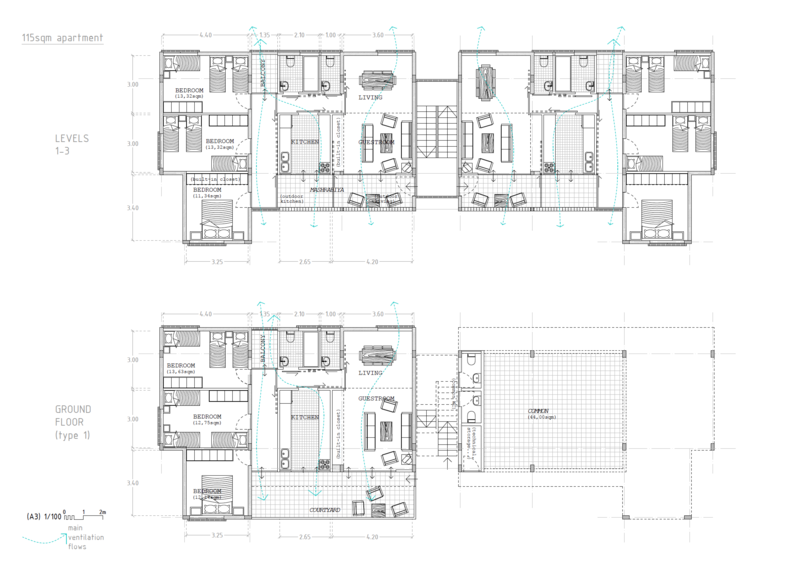 We imagined the design of the ground floor as a common space where rituals such as weddings or funerals could take place, as well as commercial activity. We refrained from overly designing these spaces, from thinking of them as public spaces. Knowing that there will be no public to take care of these common spaces, we offered the possibility for the neighborhood to activate them in different forms of appropriation. These common spaces differed from public spaces as they could only exist with the active participation of people. They were a contemporary and urban reinterpretation of the hosh, private courts that different families would share in an ongoing organization made of conflict and appropriation. What miraculously still exists in Palestinian society, despite years of ongoing violence and occupation, is a functional social fabric. Rooted in family and tribal connections, this self-regulated form of civil cohabitation and conflict resolution effectively prevents Palestine from descending into civil war like Syria or Iraq. The hosh, or urban islands, as we refer to them, aim to preserve the social fabric necessary for the constitution of a civic space of resistance; fragments of a city that could be formed only after Gaza is liberated from the military occupation and reconnected with the rest of Palestine and the world.